Tillerson, it’s clear, knows his way around the international landscape — probably far more intimately than Trump himself, who has already gaffed his way across the globe in less than two weeks in the Oval Office. But Tillerson will also have his work cut out for him in leading a demoralized State Department that is confused about the direction of foreign policy under the Trump administration. Of the 292 positions at State that require Senate approval, Trump has appointed just five — Iowa governor Terry Branstad as ambassador to China, David Friedman as ambassador to Israel, Robert Wood Johnson as ambassador to the United Kingdom, former South Carolina governor Nikki Haley as US representative to the United Nations and Tillerson himself. It is likely that Elliott Abrams, a former official in the Reagan administration and a special adviser to George W. Bush, will serve as Tillerson’s deputy secretary of state, though it’s by no means a settled deal. But no one knows yet who will serve in the third-ranked position of under secretary for political affairs — to say nothing of the dozens of lower-tier political appointments at State and ambassadorships that Trump hasn’t prioritized filling. Abrams has been a strident Trump critic, is associated with the neoconservative school that promoted the Iraq invasion of 2003 and was convicted on two misdemeanor charges of withholding information to Congress in relation to the Iran-Contra affair. 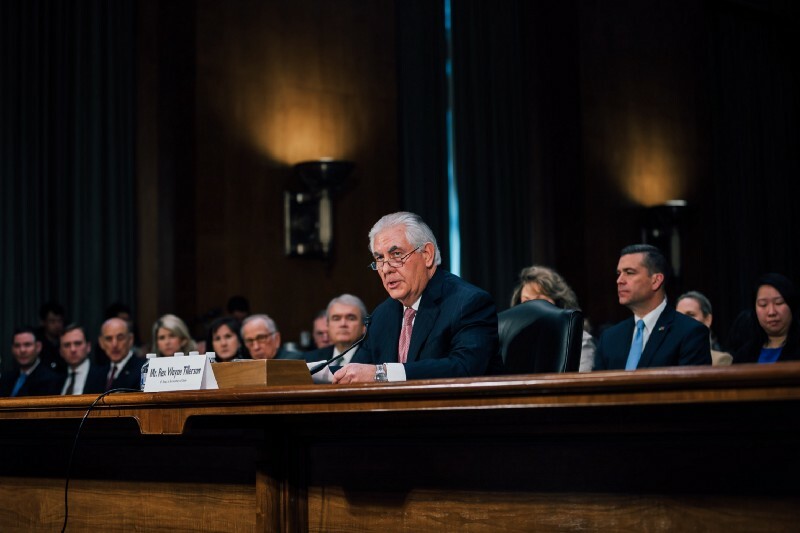 Tillerson now forms a ‘troika’ of elected cabinet officials with retired general James Mattis, the defense secretary, and retired general John Kelly, the homeland security secretary. While each is new to the executive branch, all three come from respected backgrounds in business or the military. Mattis last week was already off to South Korea to reassure the country and warn North Koreans at a time when the Trump administration’s posture has left even longtime allies uncertain and as the current elected president faces an impeachment trial. NOTE: Post updated and revised on February 6 after this website was hacked.